Shiso is an herb that adds a great, unexpected flavor to salads. Like mint, basil, thyme, and rosemary, the herb shiso is a member of the mint family. Its flavor is grassy, peppery, and fresh with faintly bitter character that makes it a great counterpart to sweeter food and drink. If you have trouble finding Shiso, you can substitute mint leaves. Dovetailing Tip: When cutting the corn off the cob for the salad, cut an additional 2-3 ears to make 2 cups of corn to use in the Meal 2 Smoked Sausage, Butternut Squash and Wild Rice Soup. 1. 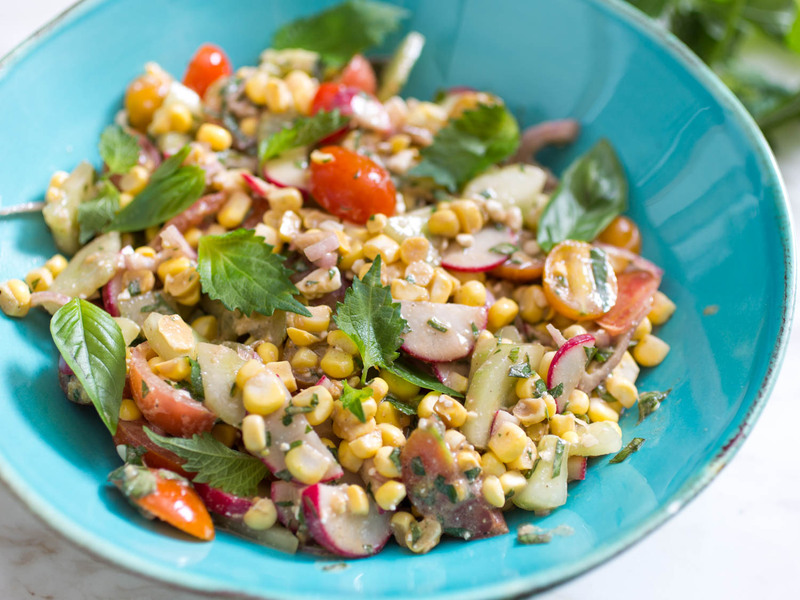 For the Salad: Combine corn, tomatoes, radishes, cucumber, shallot, feta cheese, and herbs in a large bowl. Toss gently to combine. 2. For the Dressing: Combine balsamic vinegar, olive oil, and Dijon mustard in a small bowl or sealable container. Whisk well or seal the container and shake vigorously until dressing is smooth and emulsified. Season with salt and pepper, blend again, and pour over salad. Toss until ingredients are evenly coated, then serve right away, garnishing with shiso and basil leaves.